Since you already know that exercise is important for good health, you might be trying to decide which type of workout plan is right for you. Swimming and running on a treadmill are both excellent conditioning exercises, each providing an all-over workout with cardiovascular benefits. Whether one type of exercise is better than the other depends on the individual. Remember to consult with your physician before beginning any exercise program. The number of calories burned during any specific exercise depends on how much you weigh. In general, the more you weigh, the more calories you will burn. If you weigh 160 pounds, for example, you will expend about 210 calories if you swim for 30 minutes, according to the Mayo Clinic. If you were to run on a treadmill for one hour at five miles per hour, however, you would burn just over 600 calories. If your goal is to lose weight and that is your main consideration, then running on a treadmill for one hour would be better than swimming for a half hour. 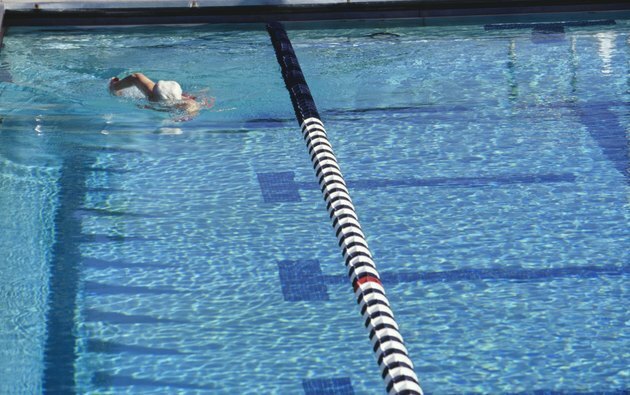 Swimming is sometimes called "the perfect form of exercise," explains the University of Arizona, because it provides an excellent cardiovascular workout while having a very low impact on the joints and muscles. This means that even those who have had joint problems with other types of exercise can often enjoy swimming. Running, whether on the road or on a treadmill, can be hard on the ankles and knees. If you have problems with your joints or need a low-impact workout for any reason, then swimming would be a better choice than running. If you don't like a particular exercise, it will be difficult to maintain your workout program. For this reason, enjoyment is a big part of determining whether running on a treadmill or swimming would be a better option for you. If the thought of putting on a bathing suit and getting into cool water does not appeal to you, then running would be a better choice. If you love the refreshing feeling of taking a dip in the pool, then a swimming program might be easier for you to stick to over the long term. If you cannot decide between running on a treadmill or swimming, remember that you don't necessarily have to choose just one. Cross-training, where you spend some time doing each of two or more forms of cardiovascular exercise, is an effective way not only to get in shape and lose weight but also to maintain interest in your program, avoid boredom and reduce your risk of injury. As long as you are getting the recommended amount of exercise, feel free to switch it up and perform different exercises on different days.